Bill's Movie News and Reviews: "How Far Away Is Fusion? Unlocking the Power of the Sun"
"How Far Away Is Fusion? Unlocking the Power of the Sun"
Fraser Cain has a short film “How Far Away Is Fusion? Unlocking the Power of the Sun”. Cain explains how hydrogen fusion into helium inside the Sun releases energy, and goes through various reactor designs in the world, starting with tokamak, intending to produce a reactor that produces more energy than what it required to heat and start it. These start with the “tokamak reactor”. The film goes through several designs, in China and then Germany, before showing the ITER experimental reactor being built in France, which may produce energy in experimental mode by 2021. I don’t know how Taylor Wilson’s reactor (Jan. 24) fits into this scheme. 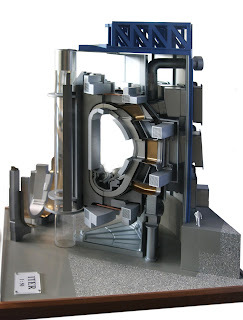 Wikipedia attribution link for ITER by Kent Ziller. Another documentary 26 minutes is "Fusion Power: How It Works" by Aerospace Documentary.